Several women have stood out lately in the Black Lives Matter protests against US cops targeting and murdering black men in America. 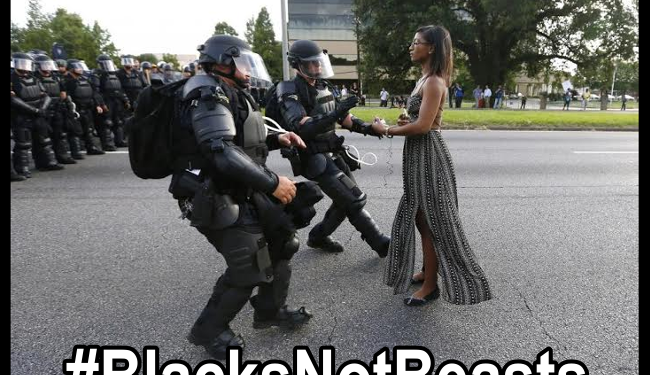 An iconic photo by Reuters captured a black lady, Leshia Evans, an activist about to be handcuffed by cops. Another video captured a black Muslim lady raging over cops harassment. tearfully, she accounted that she had lost three brothers to cops poaching of black males. Hundreds of protests have been arrested in several days of unrests across the United States since the videos of the murders of Arlon Sterling and Philando Castille went viral.